Pablo Neruda (July 12, 1904 – September 23, 1973) was the pen name of the Chilean poet Ricardo Eliecer Neftalí Reyes Basoalto. Neruda is considered one of the greatest poets of the twentieth century and one of the most influential figures in the history of Latin American literature. Neruda's poetry is renowned for its fantastic imagery and surreal use of language, forming a critical link between the Surrealist movement of early twentieth-century Spain and the Magical Realism of the latter twentieth-century in South America. Surrealism was an attempt to tap into the unconscious mind, to produce a dream-like work of art that explored truth that was "surreal," or beyond reality. Magical Realism was a literary movement of the latter half of the twentieth century, especially associated with Latin American authors, that introduced certain "magic" or fantasy elements into an otherwise realistic setting. Like many intellectuals of his era, Neruda was a committed leftist who supported Stalin, only later to be disillusioned by revelations of Stalin's totalitarian machinery of government, Neruda remained a committed communist who supported the socialist Chilean President Salvador Allende shortly before the poet's death. Unlike European socialists, Neruda was affected by the split not only between East and West, but between North and South and the economic inequities that socialism promised to remedy. Neruda's poetry directly influenced a great number of South American writers, Gabriel Garcia-Marquez, Julio Cortazar, and Isabel Allende among them. Neruda won the Nobel Prize for Literature in 1971, a controversial award because of his support of Stalin and his long-standing communist sympathies. Pablo Neruda was born in Parral, a city in Linares province, some 350 kilometers south of Santiago, Chile. His father, José del Carmen Reyes Morales, was a poor railway employee; his mother, Rosa Neftalí Basoalto Opazo, was a schoolteacher who died two months after he was born. Neruda and his father soon moved to Temuco, where his father married Trinidad Candia Marverde, the woman with whom he had fathered a child nine years earlier, a boy named Rodolfo. Neruda also grew up with his half-sister Laura, one of his father's children by another woman. The young Neruda was called "Neftalí", his late mother's middle name. His interest in writing and literature was opposed by his father, but he received encouragement from others, including Gabriela Mistral, who headed the local girls' school at that time, and later won the Nobel Prize for Literature. His first published work was an essay for the local daily newspaper, La Mañana, at the age of 13. By 1920, when he adopted the pseudonym of Pablo Neruda, he was a published author of poetry, prose, and journalism. Neruda's reputation was growing both inside and outside of Chile, but he was plagued by poverty. In 1927, out of desperation, he took an honorary consulship in Rangoon, then a part of colonial Burma. Later, he worked in Ceylon, Jakarta, and Singapore. In Jakarta he met and married his first wife, a tall Dutch bank employee named Maryka Antonieta Hagenaar Vogelzang. While on diplomatic service, Neruda read large amounts of poetry and experimented with many different poetic forms. He wrote the first two volumes of Residencia en la tierra, which included many surreal poems, later to become famous. After returning to Chile, Neruda was given diplomatic posts in Buenos Aires and then Barcelona, Spain. He later replaced Gabriela Mistral as consul in Madrid, where he became the center of a lively literary circle, befriending such writers as Rafael Alberti, Federico García Lorca, and the Peruvian poet César Vallejo. During this period, Neruda became slowly estranged from his wife and took up with Delia del Carril, an Argentine woman who would eventually become his second wife. As Spain became engulfed in civil war, Neruda became profoundly politicized for the first time. His experiences of the Spanish Civil War and its aftermath moved him away from individualistic, inwardly-focused work towards works that were socially and politically engaged. Neruda became an ardent communist, and remained so for the rest of his life. The radical leftist politics of his literary friends, as well as that of his second wife were contributing factors, but the most important catalyst was the execution of García Lorca by forces loyal to Francisco Franco. Following the election in 1938 of President Pedro Aguirre Cerda, whom Neruda supported, he was appointed special consul for Spanish emigration in Paris. There Neruda was given responsibility for what he called "the noblest mission I have ever undertaken": shipping 2,000 Spanish refugees, who had been housed by the French in squalid camps, to Chile on an old boat called the Winnipeg. Arise to birth with me, my brother. You will not return from these stone fastnesses. You will not emerge from subterranean time. Bolstered by his experiences in the Spanish Civil War, Neruda, like many left-leaning intellectuals of his generation, came to admire the Soviet Union, partly for the role it played in defeating Nazi Germany (poems Canto a Stalingrado (1942) and 'Nuevo canto de amor a Stalingrado' (1943)). In 1953 Neruda was awarded the Stalin Peace Prize. Neruda's fervent Stalinism eventually drove a wedge between him and his longtime friend and writer Octavio Paz who commented that, "Neruda became more and more Stalinist, while I became less and less." Although Paz still considered Neruda "the greatest poet of his generation", in an essay on Alexander Solzhenitsyn he wrote that when he "thinks of … Neruda and other famous Stalinist writers I feel the gooseflesh that I get from reading certain passages of Dante’s Inferno. No doubt they began in good faith, but insensibly, commitment by commitment, they saw themselves becoming entangled in a mesh of lies, falsehoods, deceits and perjuries, until they lost their souls." Neruda later came to rue his support of the Russian leader; after Nikita Khrushchev's famous Secret Speech at the twentieth Party Congress in 1956, in which he denounced the cult of personality that surrounded Stalin and accused him of committing crimes during the Great Purges, Neruda wrote in his memoirs: "I had contributed my share to the personality cult," explaining that "in those days, Stalin seemed to us the conqueror who had crushed Hitler's armies." On a subsequent visit to China in 1957, Neruda would later write: "What has estranged me from the Chinese revolutionary process has not been Mao Tse-tung but Mao Tse-tungism," which he dubbed Mao Tse-Stalinism: "the repetition of a cult of a Socialist deity." However, despite his disillusionment with Stalin, Neruda never lost his essential faith in communism and remained loyal to its ideals. On March 4, 1945 Neruda was elected a Communist party senator for the northern provinces of Antofagasta and Tarapacá in the arid and inhospitable Atacama Desert. In 1946, Radical Party presidential candidate Gabriel González Videla asked Neruda to act as his campaign manager. González Videla was supported by a coalition of left-wing parties and Neruda fervently campaigned on his behalf. Once in office, however, González Videla turned against the Communist Party. The breaking point for Senator Neruda was the violent repression of a Communist-led miners' strike in October 1947, in which striking workers were herded into island military prisons and a concentration camp in the town of Pisagua. Neruda's criticism of González Videla culminated in a dramatic speech in the Chilean senate on January 6, 1948 called Yo acuso ("I accuse"), in the course of which he read out the names of the miners and their families who were imprisoned at the concentration camp. A few weeks later, Neruda went into hiding and he and his wife were smuggled from house to house, hidden by supporters and admirers for the next 13 months. While in hiding, Neruda was removed from office and in September 1948 the Communist Party was banned altogether under the Ley de Defensa Permanente de la Democracia (Law for the Permanent Defense of Democracy) which eliminated over 26,000 people from the electoral registers, thus stripping them of their right to vote. Neruda's life underground ended in March 1949 when he fled over the Andes Mountains to Argentina on horseback. He would dramatically recount his escape from Chile in his Nobel Prize lecture. Neruda spent the next three years traveling extensively throughout Europe as well as taking trips to India, China, and the Soviet Union. While in Mexico Neruda also published his lengthy epic poem Canto General, a Whitman-inspired catalog of the history, geography, and flora and fauna of South America, accompanied by observations and experiences. By 1952, the González-Videla dictatorship was on its last legs, weakened by corruption scandals. The Chilean Socialist Party was in the process of nominating Salvador Allende as its candidate for the September 1952 presidential elections and was keen to have the presence of Neruda—by then considered Chile's most prominent left-wing literary figure—to support the campaign. By that time, Neruda enjoyed worldwide fame as a poet, and his books were being translated into most major languages of the world. He was also vocal on political issues, vigorously denouncing the U.S. during the Cuban Missile Crisis. As one of the most prestigious and outspoken leftwing intellectuals, he also attracted opposition from ideological opponents. In 1970, Neruda was nominated as a candidate for the Chilean presidency, but he gave his support to Salvador Allende, who won the election and was inaugurated in 1970 as the first democratically-elected socialist head of state. Shortly thereafter, Allende appointed Neruda the Chilean ambassador to France (lasting from 1970-1972; his final diplomatic posting). After two years Neruda returned to Chile due to failing health. Look around—there's only one thing of danger to you here—poetry. 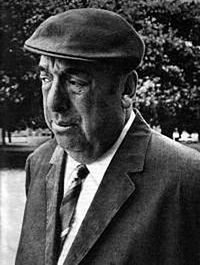 Neruda died of heart failure on the evening of September 23, 1973, at Santiago's Santa María Clinic. His funeral took place with a massive police presence, and mourners took advantage of the occasion to protest the Pinochet regime. Neruda's poetry was outlawed in Chile by the junta until the restoration of democracy in 1990. Agosín, Marjorie, 1986. Pablo Neruda. Twayne's World Author's Series. Anderson, David G., 1987. On elevating the commonplace: a structuralist analysis of the "Odas" of Pablo Neruda. Bizzarro, Salvatore, 1970. Pablo Neruda: all poets the poet. Bloom, Harold, 1989. Pablo Neruda. Modern Critical Views. Costa, René de, 1979. The poetry of Pablo Neruda. Durán, Manuel, 1981. Earth tones: the poetry of Pablo Neruda. Eisner, Mark, ed. 2004. The Essetial Neruda: Selected Poems. City Lights. A compendium of poems published in commemoration of the Centenniel anniversary of his birth. Feinstein, Adam, 2004. Pablo Neruda: A Passion for Life. Goodnough, David, 1998. Pablo Neruda: Nobel prize-winning poet. Hardie, St. Martin, (transl.) 1977. Pablo Neruda: Memoirs (Confieso que he vivido: Memorias) Penguin. Twentieth Century Classics. Longo, Teresa, 2002. Pablo Neruda and the U.S. culture industry. Méndez-Ramírez, Hugo, 1999. Neruda's ekphrastic experience: mural art and Canto general. Nolan, James, 1994. Poet-chief: the Native American poetics of Walt Whitman and Pablo Neruda. Poirot, Luis, 1990. Pablo Neruda: absence and presence. Rogovin, Milton, 1999. Windows that open inward: images of Chile. Roman, Joe, 1992. Pablo Neruda. Santí, Enrico Mario, 1982. Pablo Neruda, the poetics of prophecy. Teitelboim, Volodia, 1992. Neruda: an intimate biography. "True Stone and Epitaph: the Poetry of Pablo Neruda" by Gilbert Wesley Purdy. A full-length book review/essay which includes a biography of Neruda. This page was last modified on 9 January 2019, at 17:38.